For a few short hours in December, the entire simming and online role playing community will come together to share ideas, role play, and join in a few trivia games–all in IRC chat rooms. 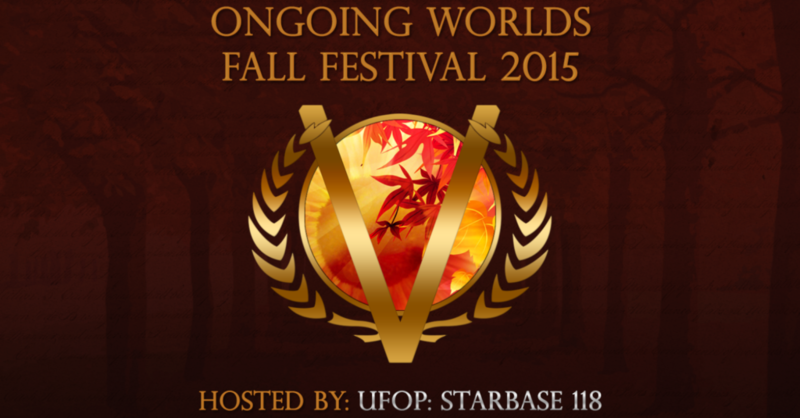 FallFest is not only open to all simmers and role players on the net, but all are also permitted to host one or more one-hour events within the festival. This year’s FallFest will be held on December 5th from 8:30 AM to 5:30 PM EST (1:30 PM to 10:30 PM GMT). Joining in the festivities is easy! Just click here to open our chat window – no extra software required. Just enter an alias and connect. Session 1 Character development – Learning from the best characters in TV & Films: A chat about the best characters on TV and in films, and what we can learn about them when creating and writing for our own characters. Anodyne Productions – The Future of RPG Management: It’s been 5 and a half years since Anodyne Productions released Nova as the successor to the SIMM Management System and the next generation of how people manage their games. Since Nova’s release though, the way we interact with our games and the world as a whole has evolved at a breakneck pace, while Nova and other RPG management options haven’t. As a result, playing these games can be a painful reminder of how behind the times they’ve fallen. Ses. 2 Mary Sue: Model Citizen or Menace to Society? : “Mary Sue” is a character concept that most simmers automatically rally against, and yet we rarely discuss what is so awful about the Mary Sue archetype – and frequently fail to recognize the good things about a Mary Sue concept. With visual guides, litmus tests and a plethora of ridicule against Mary Sue, writers are often shocked to find that their favorite characters score highly on such tests. What turns a character from someone we adore to someone we hate? Come find out why and discuss your own best practices for character building in this chat session. The Importance of an Out of Character Community: Out of Character communication can make or break a community. In this discussion, we will show you what the benefits are to an OOC community and methods to make your community succeed! We’ll be talking about everything from outlets of communication (IRC, forums, etc) to community guidelines. Ses. 4 We’re All In This Together: The Case For Collaborative Storytelling: Most sims don’t allow you to control other players’ characters. We’re here to talk about why removing restrictions on using other PCs in your posts can free your writing and open your game to a whole new creative dimension. Writer’s block and how to break through the wall: Writer’s block is common among writers, no matter if alone or in a group. Let’s take a look at different techniques to break through. Ses. 5 Art and Roleplays – How to Enhance the Experience for Players: Have you ever had that extra step you wanted to take in your game and didn’t know how? Did you ever think of the visual aspect? Learn how to enhance your game’s atmosphere through the use of visual art! Federation News Service: A new simming community IC hub: UFOP: SB118 is spinning-off our “Federation News Service,” which until now has been an internal, In Character hub of news about our characters plots. Now, we’re welcoming the entire Star Trek simming community to participate in the site. You’ll be able to submit stories to the FNS with links back to your own site, and participate in metaverse development. Join this session for more information! Ses. 6 Role-play in the 26th Century: Enjoy this 1-hour live-chat session and discover an original science-fiction setting at the same time. This sneak preview of New Worlds Project’s original sci-fi 26th Century role-play will put you at the heart of the frontlines of the Milky Way Galaxy. Can you help the UNSS Europa succeed in its mission?. Learn about the setting at http://legacy.nwproject.org FNS 2392 Presidential Live Debate: Five candidates in the 2392 presidential election are on the stage, ready to take tough questions from the moderator about the future of Federation leadership. And you’ve got a front-row seat! Ses. 8 Developing Relationships in Roleplay: The chat will be about developing relationships in Roleplay: romantic, friendship and even fiends. Co-Writing; Real time co writing for shared posts: In my clique of writers at OngoingWorlds we heavily rely on co-writing through Google Docs to write more dynamic and engaging posts. Let’s get a discussion sharing experiences, does and don’ts, tips and advices. The schedule is currently full. Please check back tomorrow to see if we’ve re-opened session registration!